In 2013 the attacks on welfare continued. The Social Security (Benefit Categories and Work Focus) Amendment Bill, was passed in April and came into effect in July. Previous benefits were collapsed into three: Job Seeker Support, Sole Parent Support and Supported Living Payment. Most people are expected to look for work including the sick and most sole parents. The only exceptions are those on the Supported Living Payment, and some sole parents but they can be asked for a work plan. The welfare changes are scary, and a media survey indicated that beneficiaries are now perceived to be the group suffering the most prejudice. Sanctions are being widely used, throwing many beneficiaries into desperation and destitution, and WINZ is increasingly using private contractors to administer job- seeking activities. Many beneficiaries are forced to do these activities, which can include to doing slave labour for private companies. This can include grandparents, those who already have jobs, the mentally ill, and mothers with babies. Job seeking requirements and the threat of punitive sanctions are creating enormous anxiety for many beneficiaries. WINZ case officers are acting with increasing disrespect and apparent arbitrary cruelty. It is commonplace to refuse food grants even when the beneficiary is hungry, and entitled to one. In November 2012 I wrote a submission opposing the Social Security (Benefit Categories and Work Focus) Amendment Bill. 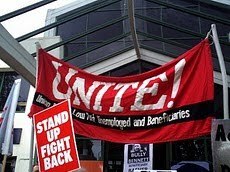 At the Unite National AGM in November 2012, we presented a remit that Unite ask the CTU to call a National Stop Work meeting against the welfare reforms. An amended remit was passed asking the CTU to call a National Day of Action against the welfare reforms. Our remit opposing the Trans Pacific Partnership Agreement was passed. 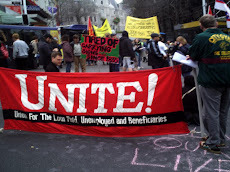 In December 2012 we held a protest to "Stop Paula's War on the Poor" outside the Mt Albert Baptist Church, where Paula Bennett was speaking at the invitation of National M.P. Melissa Lee. 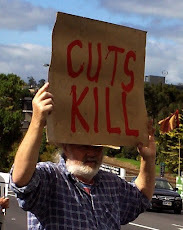 In February 2013 an invited speaker gave us a talk about the way Dr Bratt, the Principal Medical Adviser of WINZ , is training designated doctors and regional health and disability advisors, how to deny benefits to people. In late 2012 and early 2013 our Vice President Ivan Sharma gathered support for a Day of Action against the sale of State Housing, which was held in April 2013. He created a facebook event page; our members handed out leaflets, and I issued a press statement. Ivan and Bob attended Tamaki Housing Action Group meetings to co-ordinate plans for the day. We held a mock auction of the office of National Party MP Melissa Lee. We were supported by a number of groups and individuals including AAAP. Afterwards we protested outside some state houses in Haverstock Rd, which had already been sold. We acted in solidarity with the Tamaki Housing Action Group who held a protest in Glen Innes against developers on the same day. 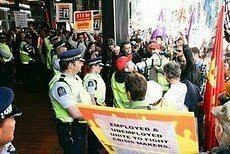 Our protest was filmed by Maori Television and appeared on Te Kaea that night. for starting- out 16 -17 year olds, trainees from 16-19 years, and adult 18 -19 year old workers who had been on a benefit in the previous 6 months. In July, the new benefit categories came into effect. 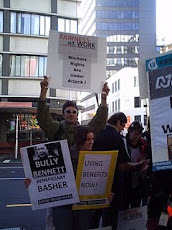 We attended a protest in support of beggars' rights, outside Smith and Caughey's in Queen St. This protest had been called because Smith and Caughey's, and some Council members and organisations including Mike Lee, and the Heart of Auckland, were calling for restrictions on beggar's rights to beg. weet-bix breakfasts in low- decile schools. In August we held an evening protest outside Paula Bennett's office where she held another public meeting. We created a facebook event, leafletted, and I promoted it on our blog: waitemataunite.blogspot.co.nz. I wrote an updated flyer "Why You Should Join Unite" which we printed and distributed . I also put it onto our blog. 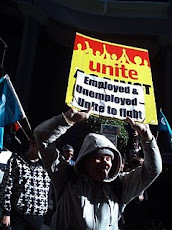 Dave Bedggood was interviewed on Radio Waatea about the protest and the welfare changes. I wrote a press statement against the proposed new Child Protection Laws. In September I helped out at the Impact-on the spot advocacy- organised by the Auckland Action Against Poverty at New Lynn WINZ. Some of our members attended. In October I wrote a leaflet entitled "How to get WINZ help for Sickness and Disability". Keith and others have been distributing it. I put it onto our blog as well as some information about the Health and Disability Panel, who advised on the welfare reforms. I've included information about the Bio Psycho Social "work is good for you " ("arbeit macht frei ") approach, which has been imported from the UK to New Zealand. Our blog: waitemataunite.blogspot.co.nz has had 31,634 page views since it started. Our Facebook group Waitemata Unite has 172 members, our Unite Waitemata organiser page has 540 Friends , and our Unite Waitemata Community Page has 90 members. We are doing more advocacy and peer support with some success. Sometimes this leads to people coming to our meetings or joining up. People are contacting me through our facebook pages and using our unitewaitemata@gmail.com address. In October Ivan and I met with the President of Unite, Gerard Heihir, to see if we we can work together to promote beneficiary rights, and recruit and organise beneficiaries. One possibility was puting our details on the Unite website. Most of our members received membership cards this year, for the first time.